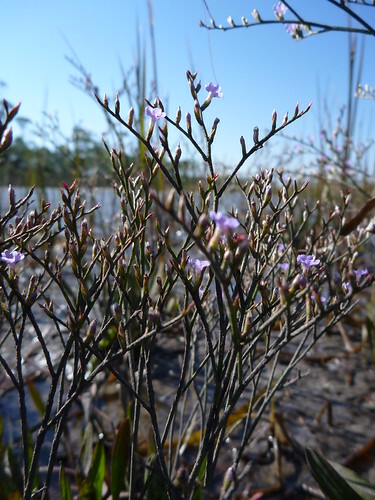 The species on this page are typical of a north Florida salt marsh. 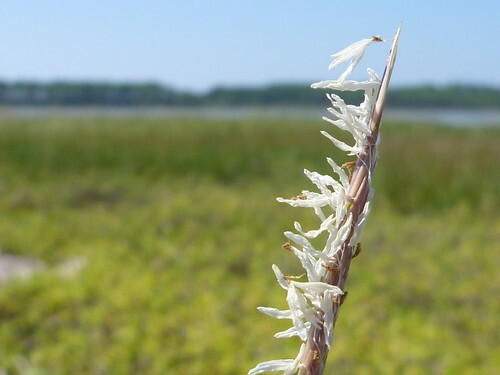 Dr. Randall Hughes is conducting an NSF funded study on biodiversity in salt marshes, and included in the descriptions are links to blog posts related to that study. 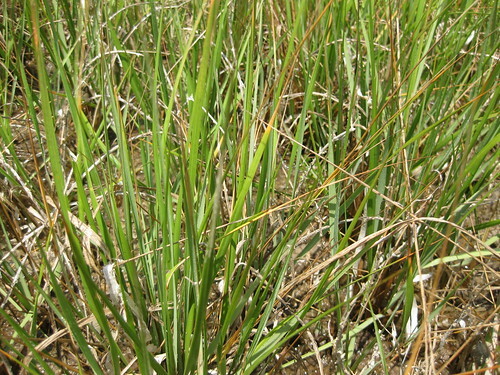 Cordgrass is often the dominant species of the coastal salt marsh. It is the “foundation species” of a salt marsh, creating the habitat and offering shelter (in the Florida Gulf) to periwinkle snails, blue crabs, fiddler crabs, crown conch, and young mullet, among others. Spartina accumulates sediment, solidifying and expanding landmass along the coast. It also acts as a filter for nutrients carried by rainwater to coastal waters. Spartina reproduces in two ways. Its rhizomes can split apart, with each segment becoming a different individual with identical genetic composition. This is clonal reproduction. They also produce flowers and seeds towards the end of summer. Periwinkles climb cordgrass (Spartina) to evade their predators, which include crown conchs and blue crabs. While they do not feed on Spartina directly, they can cause the plant considerable damage. They puncture the blades of grass with their radula, consuming fungus that then grows on the scar. In the late ’90s and early 2000s, there was a large die off of marsh habitat in the southeast. Research by Dr. Brian Silliman concluded that cordgrass, weakened by drought, was being mowed down by periwinkles. Randall Hughes is following up this research, investigating the role biodiversity plays in strengthening a marsh against snails and other disturbances, natural or man made. Does the threat of predation cause the periwinkles to become frozen with fear? Or, having been chased up the cordgrass, will they eat more of it? Click here for the video. 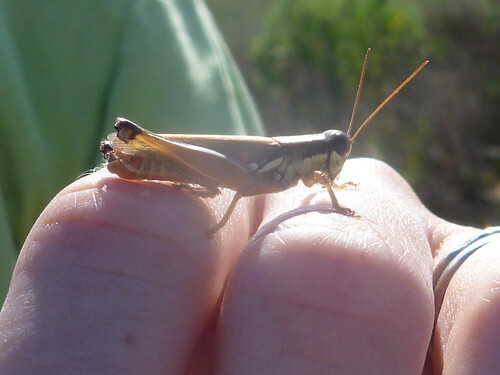 As anyone with a backyard garden is aware, grasshoppers are prodigious consumers of plants. Click to expand. As anyone with a backyard garden is aware, grasshoppers are prodigious consumers of plants. During low tide in a salt marsh, a plant on which grasshoppers dine is smooth cordgrass, the foundation species of a coastal salt marsh. Who can eat more cordgrass, grasshoppers or periwinkles? Watch here. The crown conch is a main predator of the Gulf Coast salt marsh, feeding on periwinkle snails. 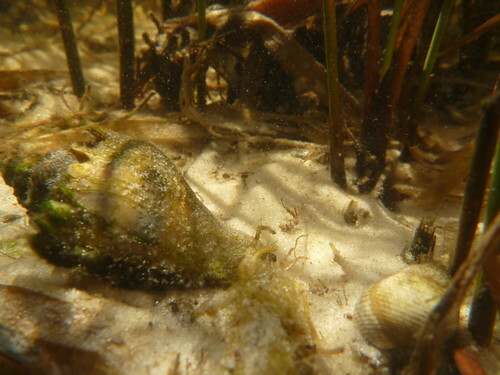 Crown conchs play a role on oyster reefs as well, consuming oysters by inserting their proboscis between an oyster’s valves. 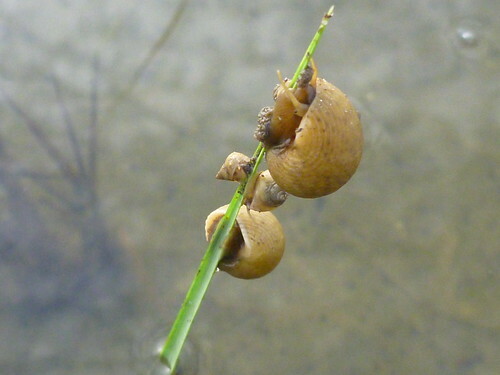 By feeding on and scaring these periwinkle snails, does the crown conch benefit or harm the marsh? Find the video here. A popular delicacy in this habitat is the blue crab, which is the crab used to make Maryland crab cakes. 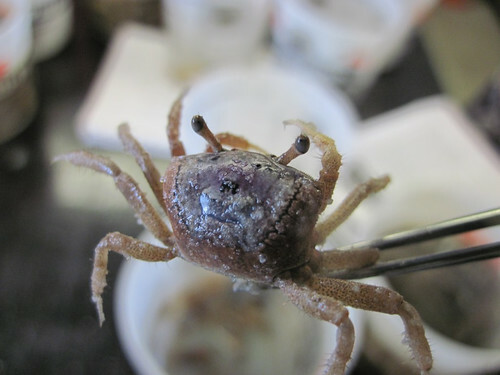 Increasingly, Maryland imports their crabs from Florida, which has more robust habitats for them. 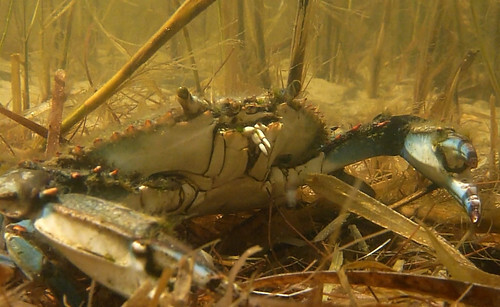 On oyster reefs and in salt marshes, blue crabs are important predators that help control populations of oyster drills, mud crabs, and periwinkle snails. Fiddlers are so named for the male’s “fiddle claw”. Click to expand. Fiddlers are so named for the male’s “fiddle claw,” their oversized claw. If the crab loses the fiddle claw, the opposite claw grows into the fiddle the next time they molt. Fiddlers are also popular pets. Their main importance in a salt marsh comes from the burrows in which they live. Scattered throughout the salt marsh, these holes allow oxygen to reach the cordgrass root system. By providing this oxygen, they ensure that the cordgrass that gives them shelter from predators. 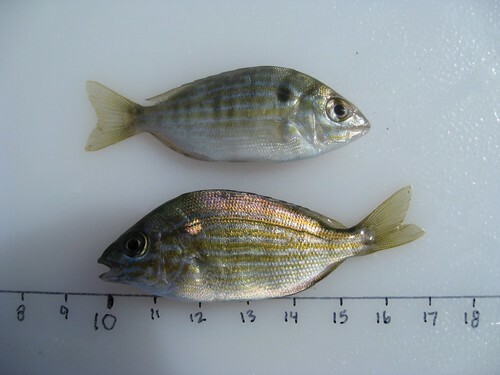 The pinfish gets its name from the sharp spines in its dorsal fin. It is a main food of the gag grouper, and is a popular bait fish. So, while it is not directly consumed by humans, it is an important part of our own food web. 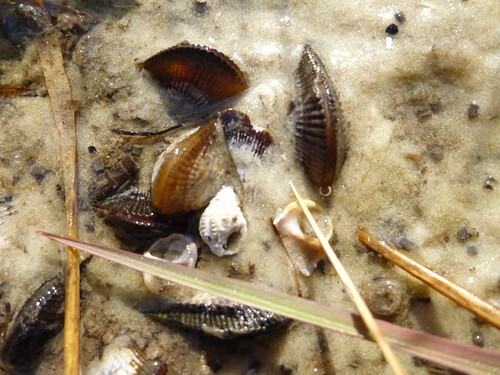 Mussels have a mutually beneficial relationship with Spartina. The base of Spartina plants provide a place for mussels to attach to and clump together. In return, the mussels provide stability for Spartina along the edge of a marsh. The mussels also filter water and provide nutrients to the plants. 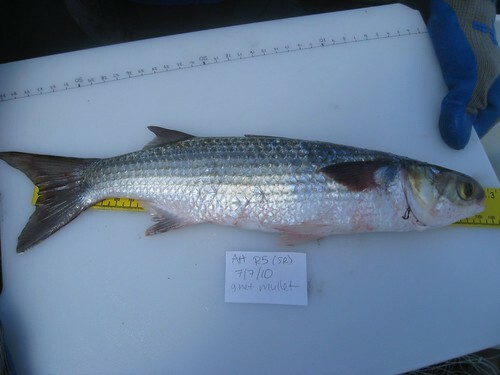 Striped mullet is an international fish, found along coastlines of every continent except Antarctica. Along the Forgotten Coast, mullet spend their juvenile years in salt marshes. There they find shelter from predators. As an adult, one of its main predators are humans, who value it as both food and bait. Mullet carrying roe are especially prized and are worth much more at fish markets. 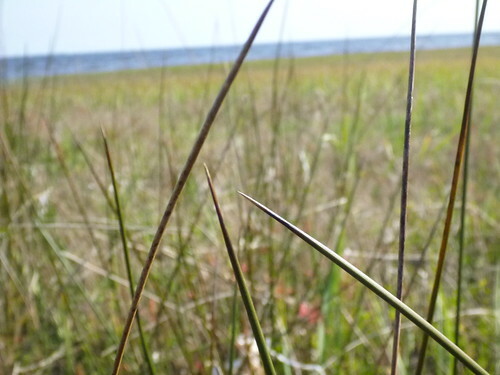 Needlerush is often found further inland in a salt marsh, as it has a lower tolerance to salinity than cordgrass. When both cordgrass and needlerush are present, periwinkles will often climb the taller needlerush, though they do not feed on it. Sea lavender grows is an herb that grows among marsh grasses. It blooms in the Summer months (June through August). Find yearly landings for commercial fisheries in Florida here.